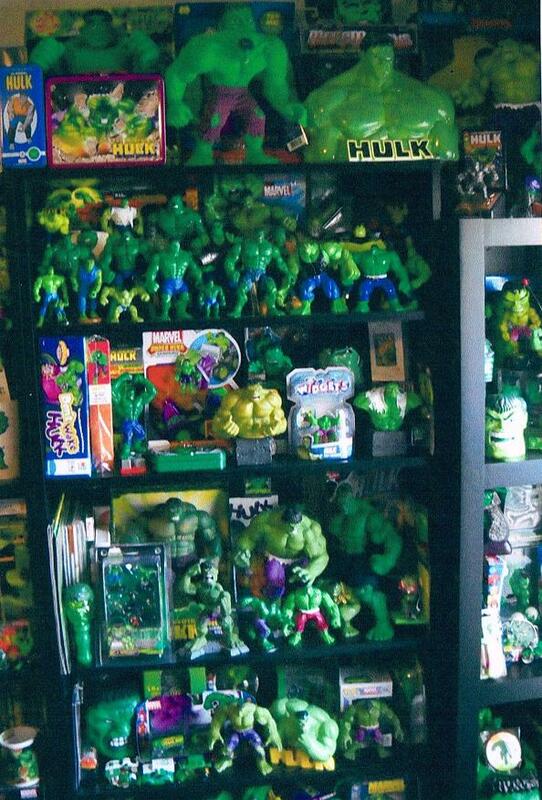 Just a random shot of the Hulk room. 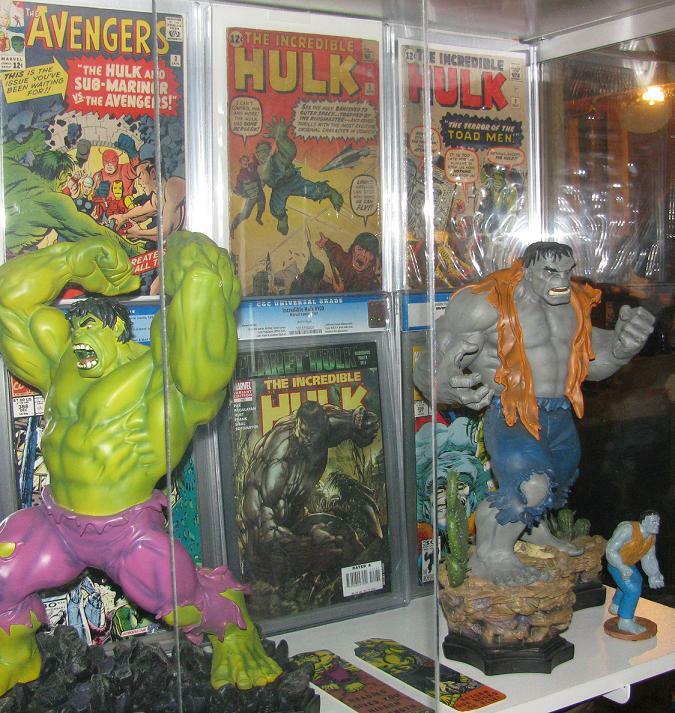 This table is chock full of great pieces including the Sideshow Hulk/Wolverine Maquette and the Master Replicas Hulk #1. 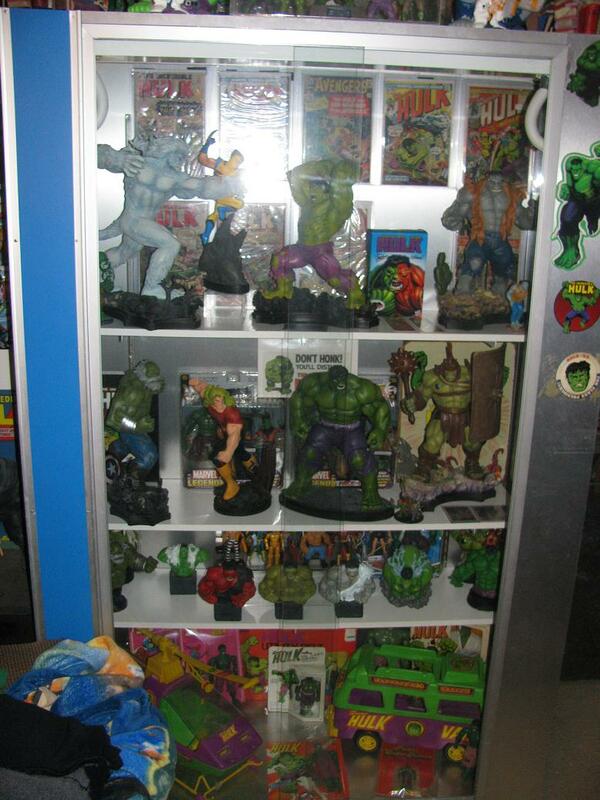 The wall is covered with figures from the Marvel Universe and the Marvel Select line. 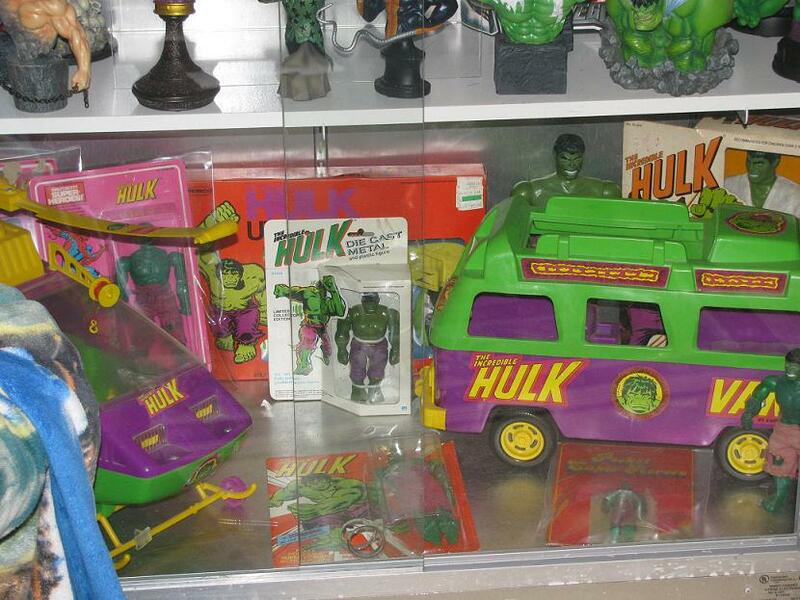 With more and more Hulk merch continuing to be released it’s always a fun game to play of trying to figure out where I’m going to fit the new stuff. I was able to snag a glass case from TRU. A case that otherwise would have ended up in the trash – glad that they were so eager to get rid of it – something this big would have easily cost close to a grand. While the set-up inside has changed over a few times only the best and my most cherished pieces go inside. 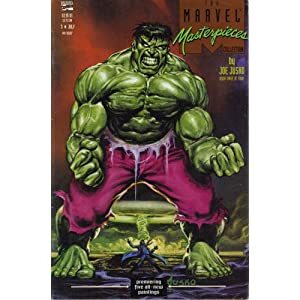 The top shelf has a nice re-creation of one of the Hulk’s most famous covers – TIH #181 – and all of the CGC and silver age beauties in the collection. 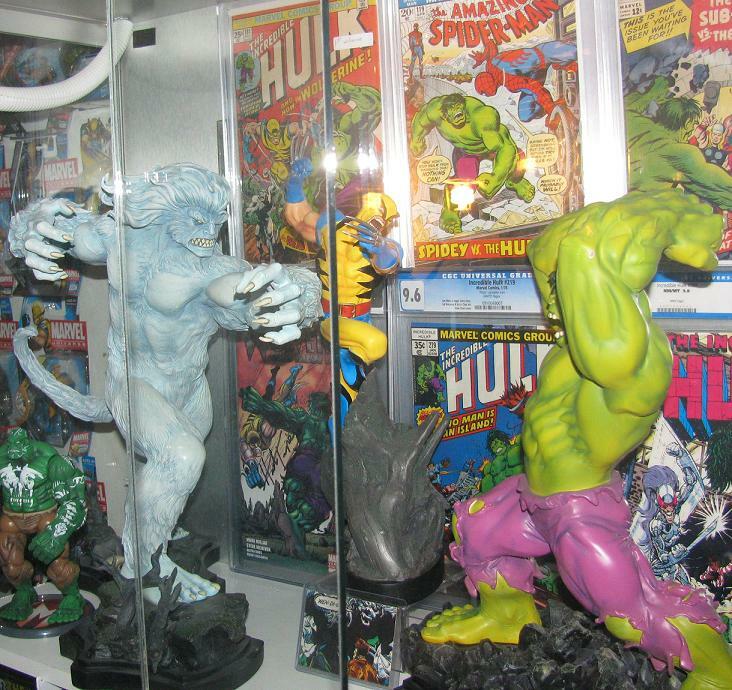 The second shelf has changed over a few times but now includes some of Bowen’s best and brightest statues: Maestro, Doc Samson, the latest Hulk (screaming head variant), and one of the most amazing – Planet Hulk. 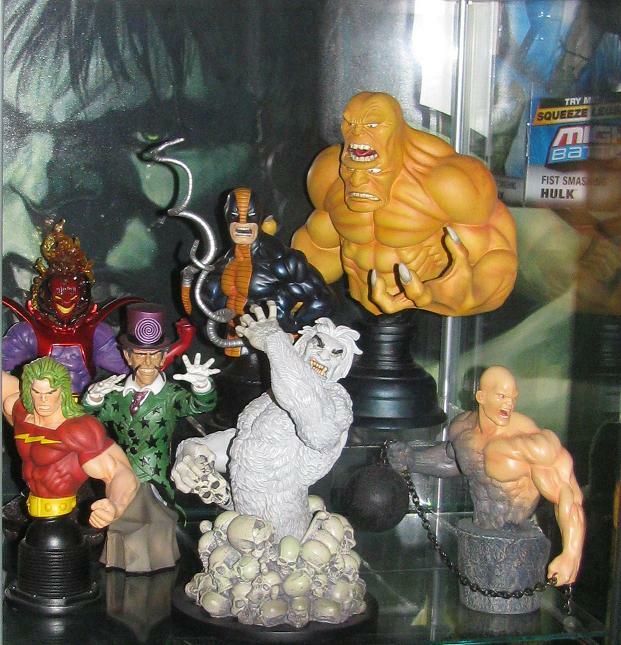 The third shelf displays the busts of Hulk and is rogues gallery. 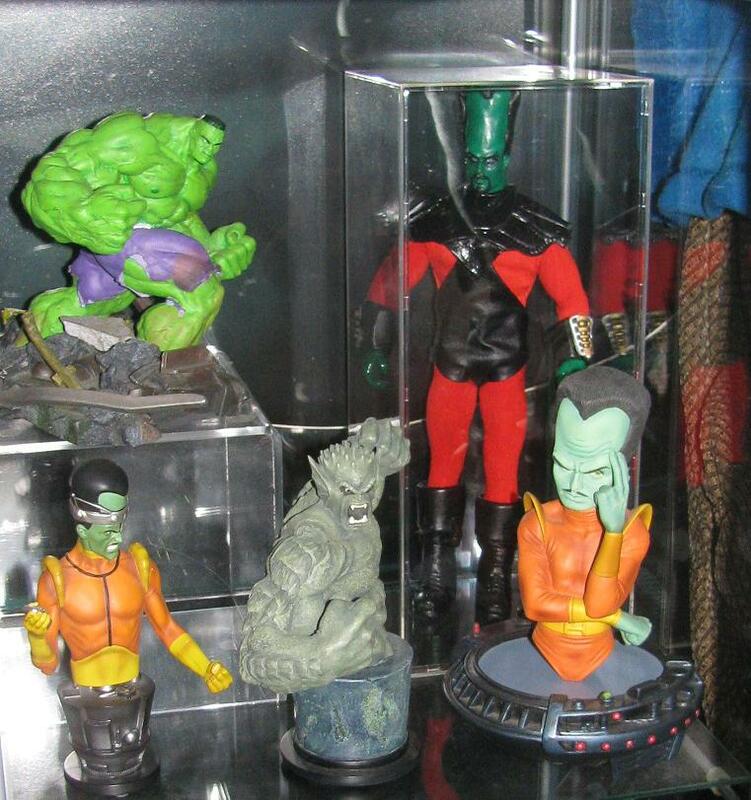 The final (and bottom) shelf is my pride and joy – a gathering of the Mego pieces I have. 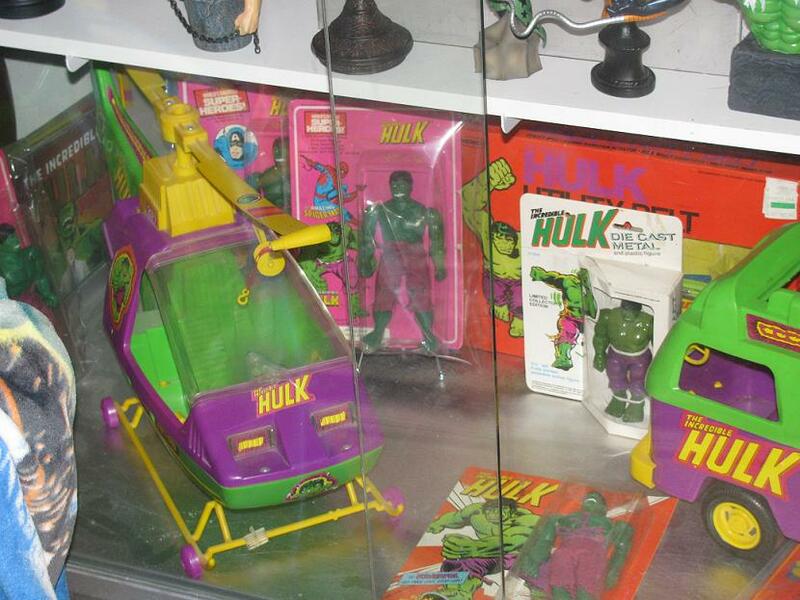 This includes the 12″ Hulk in box, Die Cast Metal Hulk in box, the many card variations of the 8″ Hulk, a pocket Mego Hulk, the Hulk helicopter and van, and the Hulk Utility Belt. 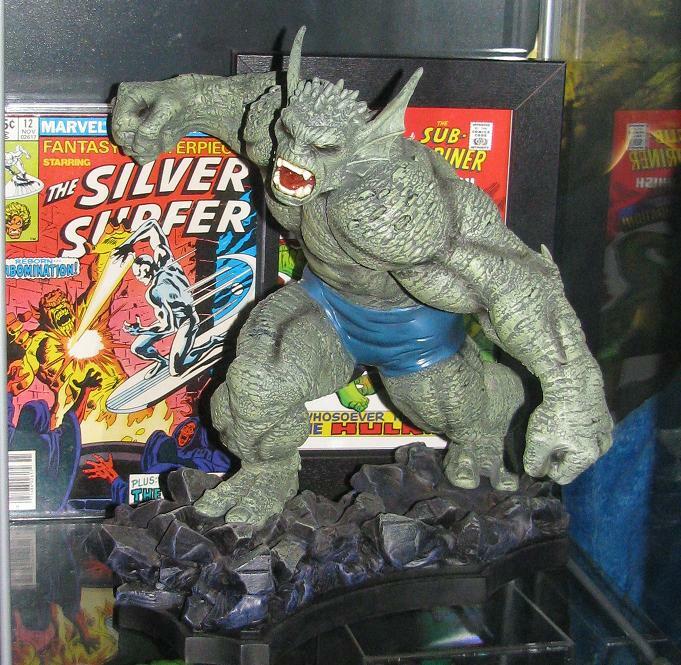 The only statue that I own that is not in a display case is the one that has the saddest story – IMO – mainly because Hard Hero had a strong beginning with their Marvel license and it ended just that quickly. 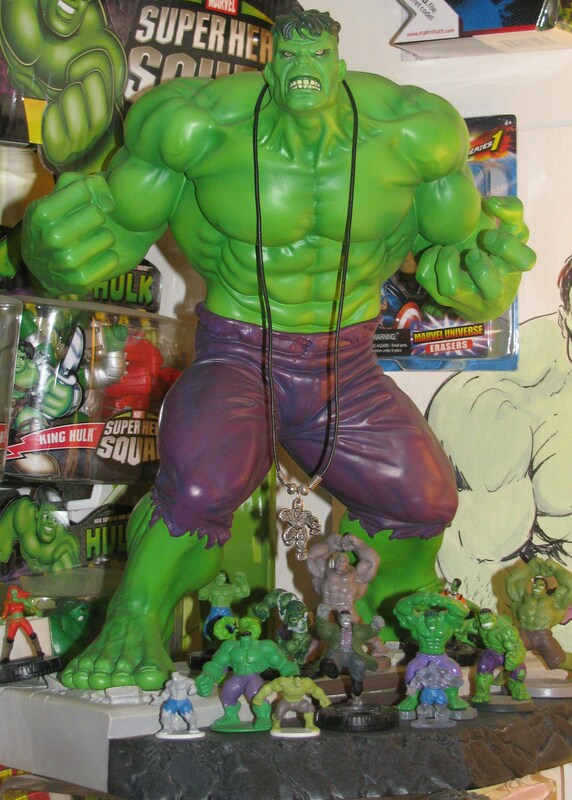 We were given this AMAZING Seth Vandable sculpted Hulk early in the first wave – so thank goodness for that. This beauty sits atop my desk with his tiny minions collected around his feet. Grey and Green alike. 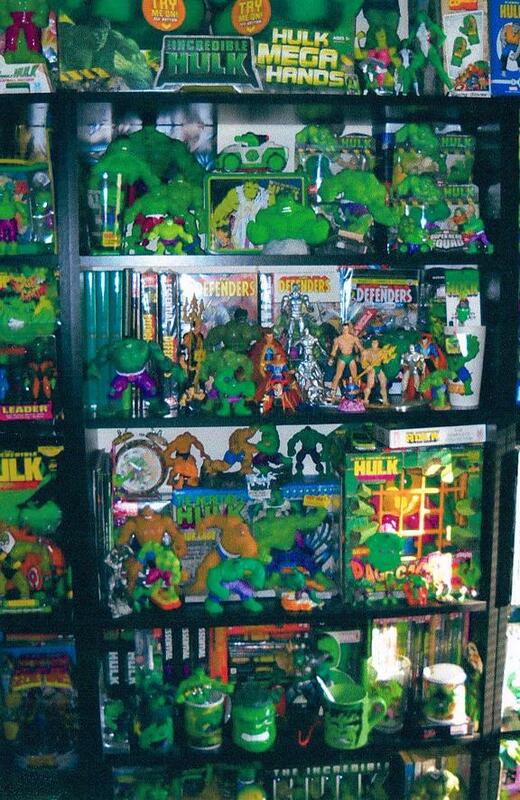 Granted these are not shots of MY Hulk room – but instead shots sent to me by constant site visitor and friend, Hulk 465. 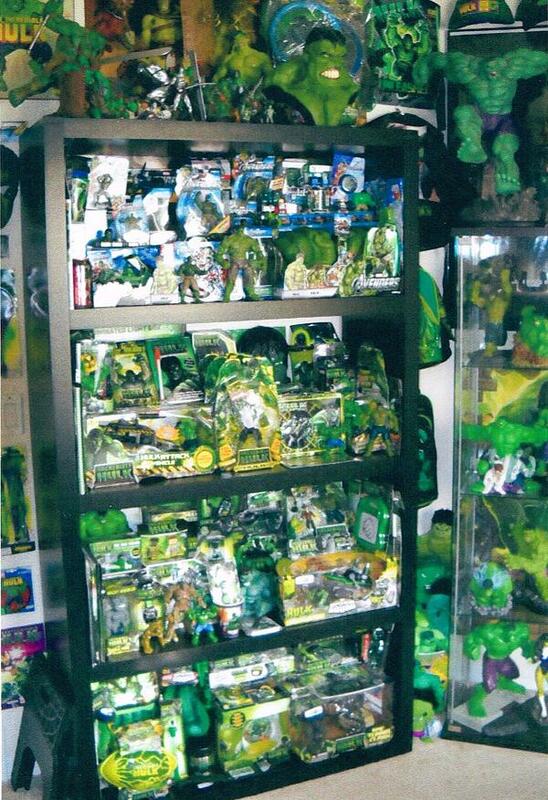 The man has quite the collection – have you ever played the “Got it, got it, need it, got it” game? Yeah, I did with these surprise pictures sent to me over the weekend. 465 was an officer in NY and just recently relocated to sunnier pastures in Florida. 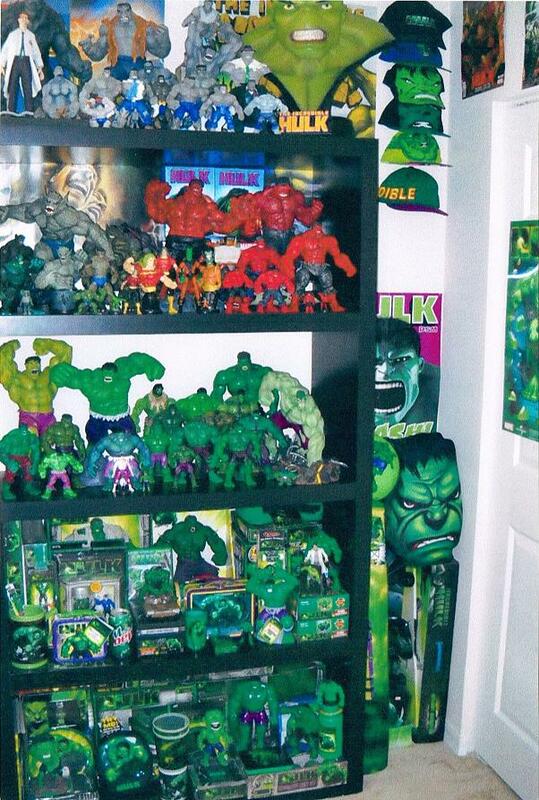 He has spent a ton of time setting up his very own Hulk room in his house. I love the different themed shelves! The Defenders shelf and Grey Hulk shelf being my favorite. I could do without the Red Hulk shelf (J/K bro!) I know I have some Red Hulk pieces too 🙂 Great shots – love all the vintage stuff and the dedication to Hulk! 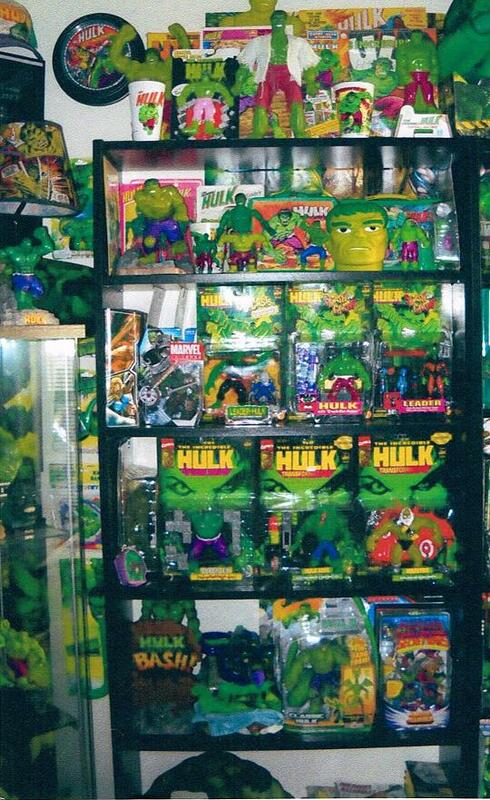 This is absolutely a room to make other Hulk fans “green” with envy! Thanks for showing it off, 465! 465 also sent me shots of a mini-comic, Hulk vs Superman, which I will have to scan and post later this week.